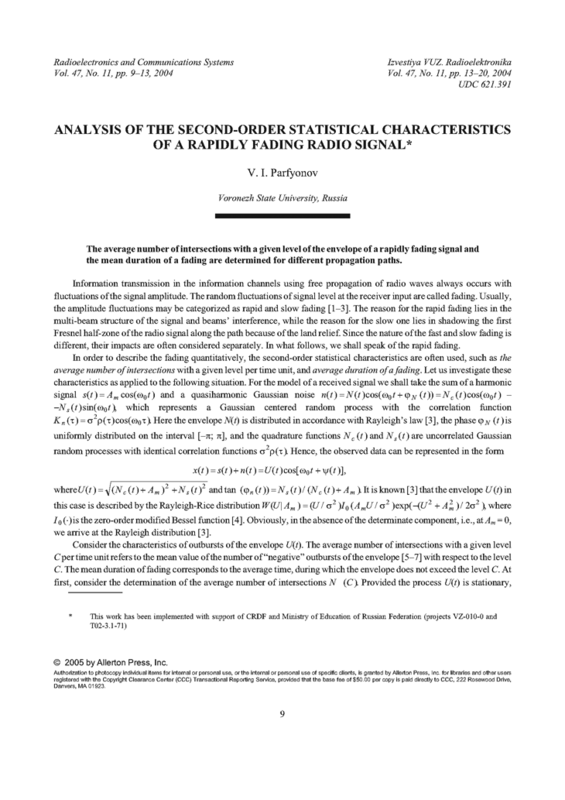 The average number of intersections with a given level of the envelope of a rapidly fading signal and the mean duration of a fading are determined for different propagation paths. KALININ A.I. ; CHERENKOVA, Ye.L. Propagation of Radio Waves and Radio Line Operation [in Russian]. Moscow: Svyaz’, 1971. DOLUKHANOV, M.P. Propagation of Radio Waves [in Russian]. Moscow: Svyaz’, 1972. FINK, L.M. The Theory of Discrete Message Transmission [in Russian]. Moscow: Sov. Radio, 1970. ABRAMOVITZ, M.; STEGUN, I.A. (eds.). Handbook of Mathematical Functions. National Bureau of Standards, 1964. TIKHONOV, V.I. Random Process Outbursts [in Russian]. Moscow: Nauka, 1970. LEE, William C. Y. Mobile Communications Design Fundamentals, 2nd ed. Wiley, 1993. MAKOVEYEVA, M.M. ; SHINAKOV, Yu.S. Communication Systems with Mobile Objects [in Russian]. Moscow: Radio i Svyaz’, 2002.